Anyone know of manufacturers that make quality JPods? 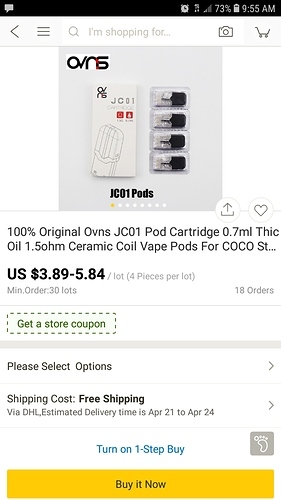 I’m from Vancouver BC and I make a full variety of THC JUUL pods…and they are top quality with no cut!! Ovns jc-01. I love the ceramics. Fasttech has em for under 5 a pack with free shipping, gets to me in about a week usually. Thanks for that! I always forget about dhgate. I always like knowing which factory makes the quality stuff, and then seek out the reps.
Much appreciate the info. Probably gonna order some. The actual jpod brand is really good, best one I tried so far. Even the cotton wick version works fine with disty. Zero failures too. Bought from dhgate. Do you know what seller is the factory? and not a reseller? If anyone has links, to factories or websites of the sellers, that is helpful. Aiming for consistency and quality here. I’m looking to buy 1000’s at a time if they works. So I’m not sure 3 packs off fasttech is a good options. What brand, where do you purchase from? I assume we want the OVNS 1.5 Ohm Ceramics? Also, curious on peoples CUT. I currently do about 6% terps with my ccells.